Oxford Rail's new Dean Goods in BR Black Livery. On loan form Oxford Rail. The year got off to a particularly good start for the club, seeing ‘Ashcombe’ and ‘Abbey Heights’ [Nick Kerslake’s layout] exhibited at the Frome show and independent financial support being given for the ‘STEM’ project, enabling it to become a reality. Both of these events feature in more detail the newsletter, along with information about some talks in February, more on the proposed Spring outing, a reminder of the modelling competition and, importantly, a note on the AGM and Committee positions. Organised by the Wessex Association of Model Railway Clubs [of which SRMG is a member (I know, but it’s a long story)], the show was held on the week-end of the 6th & 7th January and saw the club’s N-gauge layout ‘Ashcombe’ in attendance as well as Nick Kerslake’s scenic N-gauge layout ‘Abbey Heights’. Both were well received. ‘Ashcombe’ was operated by Mal Rowe and David Williams [with some help from Mrs. Rowe] and was the layout’s first foreign outing. I managed just one photo before my phone battery died but a video of the whole event can be found here and it shows both layouts in operation. ‘Ashcombe’ has been invited to exhibit again later this year at the Burnham model railway show. The Severn Valley Railway Spring Steam Gala takes place on the 16th, 17th and 18th of March. Locos attending will include LNER locos B1, B12 and the A1 ‘Tornado’, alongside the normal home fleet. As stated before, on this occasion the club will provide the coach travel free of charge. Any non-members attending will be required to pay a small premium for travel. Ticket prices: Adult £26.10, Senior £24.30, Child and SVR members £17.50. The date for our visit will be Saturday the 17th March. It is imperative that those wishing to travel sign up for this event as soon as possible in order that a coach can be booked. Places will be on a strictly first-come-first-served basis and a non- refundable deposit of £10 will be required before the club purchases the block of tickets. A poster will be placed on the club’s notice-board inviting expressions of interest this week. A really good value day out. Once again, articles for the Members’ Section of the website are eagerly sought. Contact either myself or Gwion Davies. Just a quick reminder – not that anyone can have forgotten – Noel Blows still has a diminishing stock of these wagons for sale. You may also be interested to know that the club will soon be in a position to purchase the remaining stock outright for just £400, so well has the sale gone to date. Speak to Noel if you are interested in a pur- chase, or contact him via the website. An extremely successful event at Morriston Golf Club and many thanks to John Allnutt for organising it so well. Give the universal good feed-back received, it is likely that the 2018 event will be held here also. Over 50 members and friends attended our mince-pie event which was enjoyed by all with little left on the table by 9pm! The night also saw the Clubman of the Year award presented to the 2017 Exhibiton Team, with Scott Rhodes as Exhibition Man- ager accepting the cup on behalf of his colleagues in his team. This event also allowed the chair to mention in despatches a number of club members to recognise their hard work and contributions during the year. These included John Allnutt, Noel Blows, Ian Stevenson, Steve Giffard, Mal Shore and David Williams. That list is by no means exhaustive and apologies to anyone that I may have omitted. A presentation was also made to Mrs Grigg, Richard’s mother, to acknowledge the endless stream of cakes that she has provided throughout the year. It’s drawing close now and it’s time to remind you all again of this event. The competition will be judged on Thursday, March 29th. 2018 and this time will include an additional category as well as enhanced prizes. The three existing categories [Diorama, Kit-build and Scratch-build/radically altered r-t-r] will remain but will now be accompanied by a fourth ‘Miscellaneous’ section. This will have to be clearly railway-related [so no Spitfires or Spanish galleons!] and would allow those who build for eg. their own track-work or other difficult to pigeonhole railway items to enter on a more level playing field. To further encourage you to pull your fingers out, there will also be cash prizes to accompany the traditional cups: £25 first prize and £15 runner-up. The ‘Chairman’s Cup’ winner will also receive £25. In coming years, if we are able to ‘grow’ the competition sufficiently in terms of quantity and quality, these prizes will increase in value and one of our external sponsors may well be invited to undertake the judging themselves. We really do want to make this a big event. The modelling competition is not just about show-casing your work, it is also about encouraging modellers to develop their skills. So, get on modelling and think about how you will spend your £25! A reminder that the club’s AGM will be held on Thursday 22nd. February at 7pm, in the club. As notified previously, nominations for the six Committee positions and personal statements from each of the nominees must be received by the Chair no later than Thursday the 1st. February 2018 [the latter for publication in the February newsletter]. Voting slips will be available on the night and David Williams has agreed to supervise the count, aided by David Lane. The recently issued note provides more detail on the procedure and a copy has been placed on the club’s noticeboard for anyone who did not receive it by e-mail or post. I can also confirm that David Williams has agreed to remain as Auditor for the next year and Gwion Davies has agreed to remain in post as Webmaster. This club project was announced in the November newsletter [qv]. Its development has continued and the first school to sign-up, Mayals Primary, is now ready to go forward. Ted Hylton, Phil Skinner and Mike Brooks are the project team for Mayals. It is hoped that the second school, Trallwyn, will be in a position to commence soon as well. Noel Blows originally developed this idea but he is now standing down and Ian Ste- venson has taken over its management. Ultimately, it is hoped to engage three schools in this project and a budget of up to £1000 has been agreed for the scheme. Four club members have agreed to under- write this personally and so there will be no financial liability for the club. It is also hoped to attract commercial sponsorship. This is an extremely innovative venture which, if successful, will generate positive publicity for both the club and the schools as well as teaching skills to a new, younger audience. Volunteers from within the membership are still needed and if you would like to be involved, please contact Ian Stevenson directly. A number of club members have expressed dissatisfaction over the fact that the locking-up rota does not always work effectively because nominated individuals either leave early or simply do not attend on the days when they are slated for this task. Rota duties are occasional only, especially if you are on the Thursday rota. No-one, apart from myself, is on both rotas and every attempt has been made to spread the load. Please take care to meet your obligations or arrange for a swap if you cannot attend. It’ll be ‘named and shamed’ next...! The Great Western Railway introduced its system of train identification numbers for important trains in the mid-1930s (I’m reliably told it was 1934 but I cannot confirm this 100%). The purpose of these numbers was to enable signalmen to recognise and identify an approaching train when it was still a minimum of a quarter of a mile away. Thus, they were able to set (or confirm) correct routing at junctions or to select a platform road or a through road at stations which offered this alternative. A reminder here for younger readers that in steam days there were no radios, walkie-talkies, mobile ‘phones etc. and no mimic panel lit up in the signal box to show the location of each train. The only way for the signalman to identify a train was to look at it! This was the genesis of the system now often referred to as “Reporting Numbers”. In due course, Alan’s dossier will be downloaded onto the club’s website. In the meantime, if any member has any questions about the above, or wishes to know more, please contact him directly. Richard Grigg has asked for members’ assistance in preparing reviews of new models for inclusion in the club’s website. A list of anticipated releases has been posted on the notice board and if you are interested in helping, please speak to either Richard or Gwion Davies directly. Our reviews are read quite widely and manufacturers have noted them in the past: it’s a worthwhile activity which also presents the club to a wider audience. Swansea Copper 1820-1840 – 17th. Feb @ 2pm – Discovery Room, Central Library, Swansea Civic Centre. Free [but limited space, so be early]. South Wales Railways – 23rd. Feb @ 10am – The Scout Hall, Brynmill. £3. In July 2017 I included a map of the various railway companies and their junctions in the Swansea area, taken from the Railway Clearing House Junction Diagram book for 1911. Overleaf, for this month, I have included a map [a photograph of the original] of the Cardiff area for the same period. The multiplicity of companies running be- fore the first grouping was astonishing and whilst much of the trackwork has long- since vanished, a fair bit of infrastructure remains. Note also the tiny spur of London and North Western trackwork around the Tyndall St. area. Their large goods depot is now a hotel. 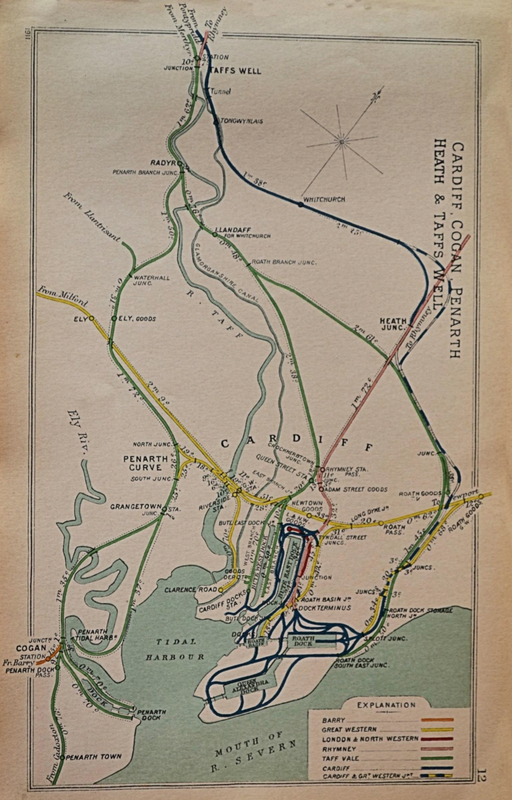 To get there, the LNWR had running rights over the Rhymney Railway.